Looking for a ready-made setting to bring to your Fate table? 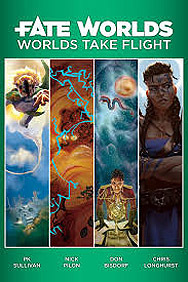 FATE Worlds: Take Flight brings four high-flying settings to stimulate your imagination and get you gaming fast. The Three Rocketeers: Journey through the Holy Roman Steller Empire and the worlds of Britannica Solaira. A laser-sharp blade and even sharper wits will serve you well as interstellar powers play the game of puppets and shadows.